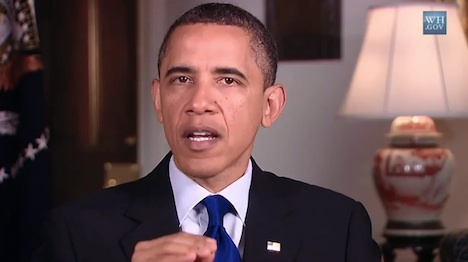 President Obama, in his weekly address, has laid out his strategy to expand domestic oil production. Obama is directing the Department of interior to conduct annual lease sales in Alaska’s National Petroleum Reserve. Additionally, the Obama Administration plans to open new areas in the Gulf of Mexico to drilling leases, speed up the evaluation of oil and gas reserves in the mid and south Atlantic, and create incentives for the oil and gas industries to develop unused leases both on and offshore. These moves come despite the devastating Gulf oil spill just over a year ago. Obama has promised that safety and environmental standards will be increased in the wake of that disaster. Obama remarked that one of the biggest burdens to the American people during the past few months has been the price of gasoline, which has reached more than $4 a gallon in many places. The president wants to eliminate the existing taxpayer subsidies given to oil and gas companies, to the tune of $4 billion a year. A vote on this issue in Congress in imminent. Obama added, as he outlined in a previous weekly address, that America should also be investing in clean, renewable sources of energy, that are the only real long-term solution to high gasolene prices. Do you support this plan to greatly expand America’s domestic oil drilling, in an effort to keep gas prices low? Obama the conservative. As a gulf coast resident I can’t say I am thrilled about this. Also, it always seems like Obama is giving things up but do we really think the dems and repubs will be able to come together to repeal the oil subsidies?? I doubt it. This will end like so much else, Obama giving something up and getting nothing in return. I mean how is this possible? The Republicans are still the fricken minority!! It seems the “Drill Baby Drill” people have got there way, even with a Democrat president.